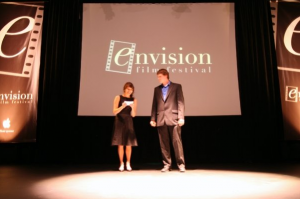 To honor aspiring Taylor filmmakers and high school filmmakers, providing a venue for public exhibition of their work. To highlight the significance of film as a medium that can express beauty, truth and goodness, prompting meaningful dialogue, engaging culture and ultimately giving glory to God. To celebrate the gifts and passions of aspiring high school filmmakers, providing an opportunity for them to enter their work in competition and to grow in community with other filmmakers. To acquaint film & media industry professionals with the work of Taylor & high school filmmakers. To provide networking and educational experiences for college and high school filmmakers by means of interaction with industry professionals. To offer opportunities for audiences to learn more about the filmmaking process in dialogue with filmmakers.